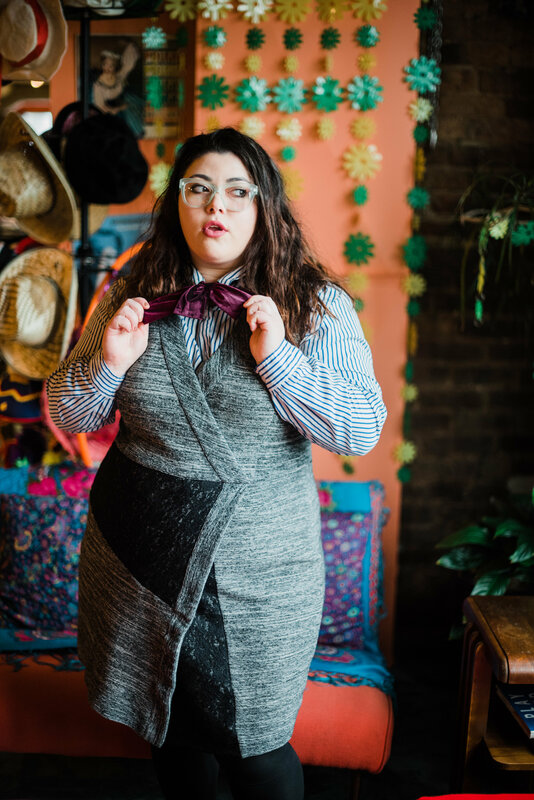 4 Tips to Layering Plus Size Like A Pro - inspo + co.
Layering can be critical if you live anywhere with crazy weather. Add a layer or throw one off and your outfit can adapt to almost any climate – and look fashionable too. Many size 12 and up women shy away from layering because they feel like it will make them look messy or “bigger”. But the truth is, every body can look great in layers if you master a few styling skills. Here are my top 4 tips to layering if you have a bigger body. No one likes feeling sweaty. Too many layers can easily overheat anyone so make sure you are layering with lightweight fabrics like jersey, linen, rayon or cotton. These fabrics are breathable and will allow airflow through your layers to keep you feeling cool and looking great. Draw attention to the narrowest point of your torso by always bringing the focus back to your waistline. This could mean layering a crop-top over a long sleeved shirt, using a belt to cinch a hoody layered over a dress or tucking in a shirt that is layered under a blazer. In my outfit for this post my Rachel Roy dress is cut to come in and highlight my waistline so I knew it would be a perfectly shaped dress for layering. One of my favorite layering looks is wearing a button-up shirt under a sleeveless dress. Or wearing a longsleeved crop-top under a spaghetti-strap maxi. It’s basic to layer a short-sleeved top under a jacket or a tank under a t-shirt. Why not mix it up and put the longer layer on first? Adding a simple striped dress shirt underneath this grey Rachel Roy dress really elevated my look! Bonus Tip: this is a great way to still wear tops that may be a little too small. 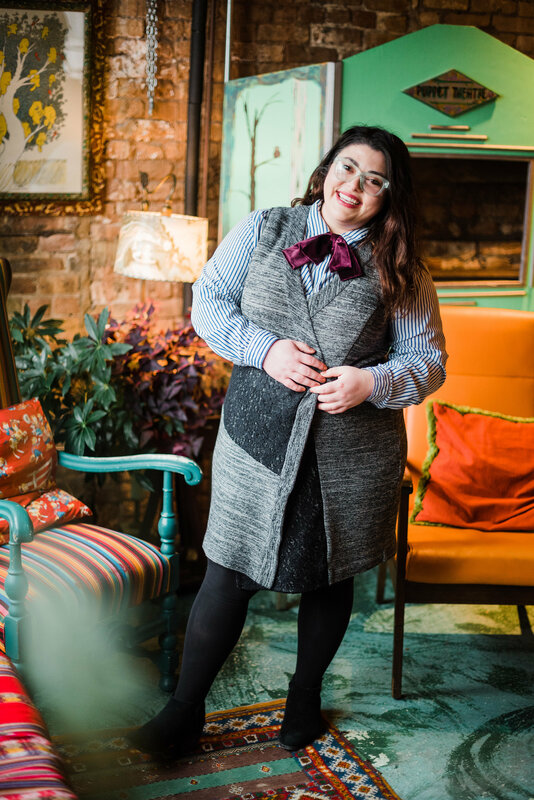 No one will see that only the top buttons still button when the top is layered under a dress AND a snug first layer will add less bulk to your outfit and fit better under other pieces. 4. Stick to a similar color tone – with one pop of contrast. Go all jewel tones with a pop of neutral or all pastels with a pop or white/black. Whatever you do – it helps to keep all layers in the same or similar tone and add only a little contrast. My necktie, tights, shoes and dress all live in the deep dark color tones while my white shirt is a white and patterned. This keeps everything cohesive, but without a pop the outfit could seem drab. Elevate it just slightly by adding that one contrasting pop – start with a bold necklace, bag or shoes if you want to start gradually. 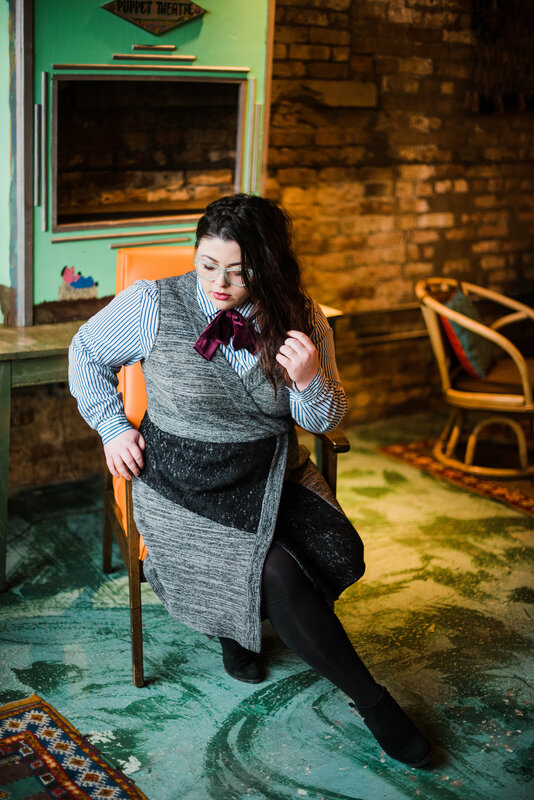 And as always…NEVER be afraid to try a trend, look or style…wear what YOU LOVE….no matter your size! 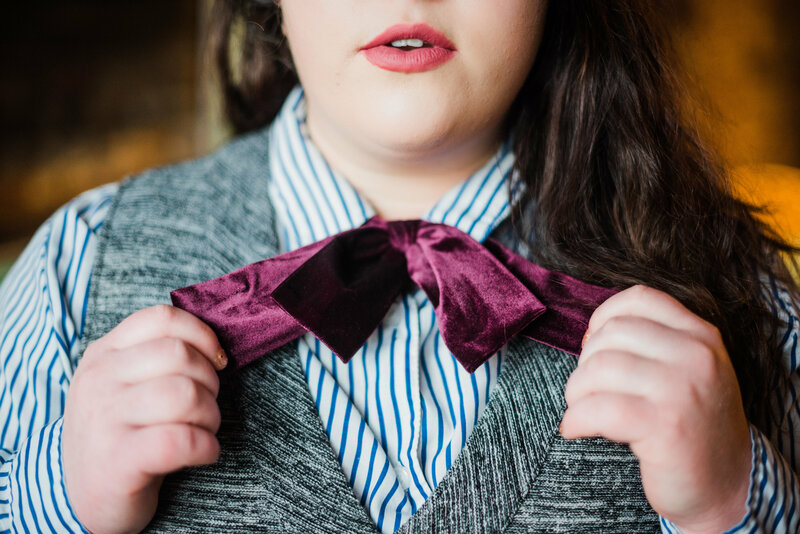 Necktie – Eloquii ONLY $7!!! © 2019 inspo + co.